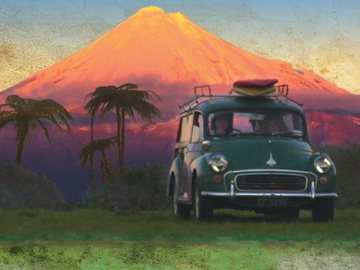 NFU-produced TV series These New Zealanders explored the character and people of six NZ towns, 60s-style. Fronted by Selwyn Toogood, it was one of the legendary presenter's first TV slots. 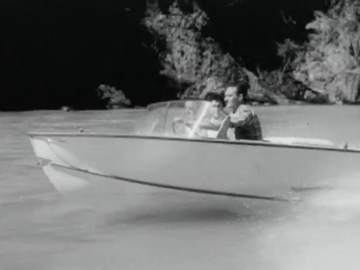 In this episode Toogood dons the walk shorts and long socks and visits Taupō, extolling the lake district as a place of play (camping, fishing, swimming, jet-boating) and work (the development of Lochinver Station for farming). Toogood does a priceless vox pop survey of summertime visitors, including the requisite quizzing of an overseas couple about whether they like it here. 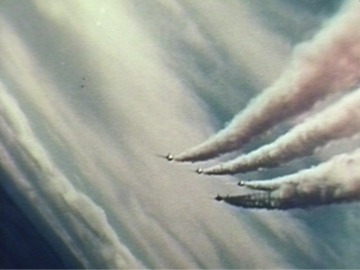 This National Film Unit short captures the action with the RNZAF’s 75 Squadron aerobatic team. The pilots, all in their early to late 20s, fly their de Havilland Vampire jets through low and high altitude manoeuvres. NFU cameraman John Hutchinson squeezed himself and his camera into the cockpit for 14 flights over five days, to capture spectacular images from a fifth Vampire piloted by Flight Lieutenant Barry Gordon. The team was formed in 1958 for the RNZAF's 21st Anniversary Air show at Ohakea. It then toured New Zealand, giving displays at all the major airports.